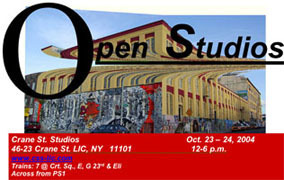 Designed a web architecture to facilitate sponsorship for two organizations Crane Street studios (200 artists building interior) and 5 Pointz (500+ artists on the exterior) and developing Aerosol Museum. In doing so, I developed a multilevel sponsorship plan based on the changes in cultural funding in the last decade. Furthermore, I devised an optional plan for live web cam interaction between artisans and sponsorship. I designed an identity for Crane Street Studios incorporating 5Pointz (the exterior aerosol artists) and interior artists. Utilizing the magnetic synergy 5Pointz has created I shearing the top of the building off as a way to intrigue the public. What is White box? Was a collaboration between Cristina Massafra and myself. 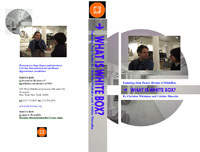 Cristina Massafra interviewed Juan Puentes of Whitebox.org concerning the mission of White box. It is both a candid and charged interview where Juan shares his insights about the art world and world politics. I was asked to conceptualize a non-profit art and technology center in Miami (via White box gallery NYC). 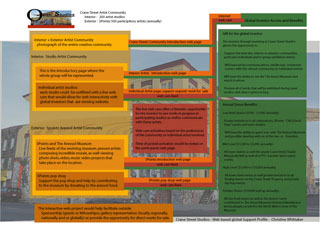 I mapped out a facility geared to multimedia artists, and provide assistive technologies, technologists, engineers and access to the surrounding community. As well I suggested that the main "composite space" have a live web cam to make the projects being built accessible to the global community. I thought the addition of the live web cam would encourage sponsorship. Flame, was scheduled to be built in Miami, Florida in 2006. I suggested a flame as an identity.